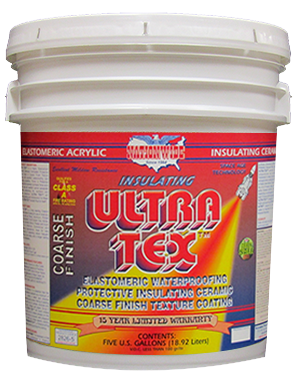 ULTRA TEX™ is a premium quality ELASTOMERIC acrylic insulating ceramic waterproofing texture coating. A high build coating with exceptional durability and weatherability. Fire retardant and excellent mildew resistance. Available in a beautiful sand or coarse textured finish for most any exterior surface. Use ULTRA FINISH™ MATTE, ULTRA FINISH™ SATIN, ULTRA KOTE™ or SATIN KOTE™ for smooth finish sealer and color coat. 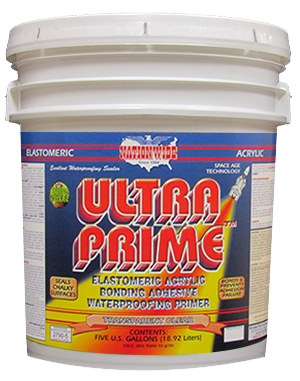 ULTRA PRIME Adhesive Clear Primer Waterproofing Acrylic. Elastomeric Waterproofing Insulating Ceramic Sand or Coarse Texture Coating. Spray or Roll Application. 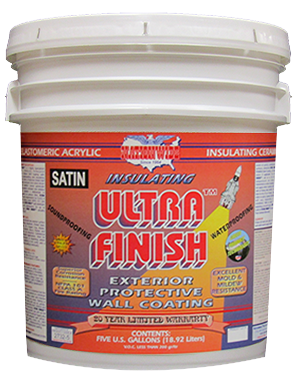 ULTRA FINISH™ for Finish Coat. 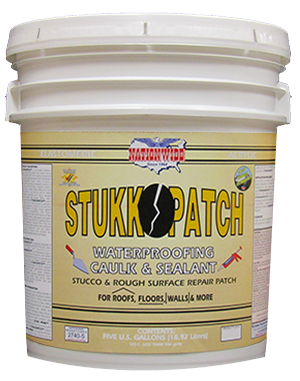 Elastomeric Waterproofing Insulating Ceramic Matte or Satin Finish 20 Year Warranty Wall Smooth Coat Finish Coat for ULTRA TEX™ Texture Coating System.